Oh my you’re going to love Bakery Style Chocolate Chip and Pecan Cookies…but only if you love big, thick soft and chewy cookies! Bakery Style Chocolate Chip and Pecan Cookies This is an amazing recipe. Once you make and eat these it’ll be very hard for you to go back to an ordinary small, thin chocolate chip cookie.You and I are going to go through a couple of steps in the directions so you understand what to expect before you make them. First…. The recipe calls for melted butter, not soft butter ….melted. This is what makes the cookie very soft and chewy. You’re going to combine the melted butter, brown sugar and white sugar and then beat them together until they are well blended. This is going to take 3 to 5 minutes to do and when you’re done the sugars and butter will be so well blended that the batter won’t look grainy. You’re going to add the egg, egg yolk and vanilla to the sugar, butter batter. Beat the batter until it’s light and very smooth, again this is going to take about 3 – 5 minutes. This step is going to make your cookies big and fat, trust me. AFTER you sift the dry ingredients together, fold the flour into the batter JUST until incorporated. Then fold in the chocolate chips and nuts. Measure the dough out with a quarter cup measuring cup, skim the top off and roll the dough into a ball, place on a parchment lined cookie sheet about three inches apart (remember these are big cookies). Bake at 325 degrees for about 15 – 17 minutes, until they look brown around the edges. They may not look done in the center but that’s ok, after baked they will sit on the cookie sheet about 10 minutes and bake more from the hot cookie sheet. Now all that’s left to do is…EAT THEM!! Enjoy! Bakery Style Chocolate Chip and Pecan Cookies - Oh my you're going to love this cookie...but only if you love big, thick soft and chewy cookies! Preheat oven to 325 degrees. Line 2 cookies sheets with parchment paper. 2. In the bowl of an electric mixer - cream together the melted butter, brown sugar and white sugar until well incorporated, the batter won't be grainy and the melted butter will be incorporated. This should take 3-5 minutes. 3. Beat in the egg, egg yolk and vanilla till light and creamy. This will take about 3-5 minutes. 4. Fold the sifted dry ingredients into the batter until just incorporated. Fold the chocolate chips and nuts into the batter. 5. Measure the dough out with a 1/4 cup measuring cup, swiping off to level it. Roll the dough into a ball with your hands and place on the parchment lined cookie sheet 3 inches apart. Bake 15 -17 minutes until edges are brown. Remove cookie sheet from the oven and place on a cooling rack to cool with cookies on it about 10 minutes. Remove cookies from sheet to wire rack to cool completely. Makes 14 big, fat chewy cookies. These look amazing. Simply amazing. Love the tutorial on how to get them so big and fat. Thank you Holly, they were so good! I hope you get to try them! and really searching for a perfect cooky, it will be part of an invitation card. My question: do you think I can freez the dough? Or the baked cooky? – they look really great!!! You can freeze the dough or the baked cookie Betty. But if I were you I’d freeze the dough, thaw it out and bake as directed. Let me know how it goes for you!! Very good looking cookie. I like soft, thick, and chewy cookies. I hate when they go flat and get crunchy. These would be a good bake sale item. Thank you Charlotte, they were soft and chewy the next day as well! I like you use more brown sugar than white sugar. I think that’s the secret to a great tasting chocolate chip cookie. Yours look amazing Mary! Do you keep them in an air tight container? Does that keep crispy ones crisp or what is the difference there? Would love to know the difference in storing them! Hi Ellen! You can keep these in an air tight container and put a slice of bread on top of the cookies and that will keep them fresh. Hi Nancy! Brown sugar has more molasses and it does make them nice and moist! This recipe was developed by the America’s Test Kitchen. Uh..I need a couple of these and a glass of milk. Oh yeah!! These are awesome looking! These look so good! I always make cookies way bigger than recipes call for so these are perfect! They sounds so yummy I can’t wait to try them for the kids. Anonymous, well that explains why the recipe makes perfect Bakery Style Chocolate Chip Cookies! I love America’s Test kitchen! Bobbi,thank you for pinning! It’s much appreciated! I hope you get to try them! Shelly, I hope you get to try these,you will LOVE THEM! Alexis,please come back and tell me how they liked them! Thanks for stopping by! Gentle Joy the melted butter is what makes them so soft and chewy, I hope you get to try them! Thanks for stopping by! Hi Kathi! The melted butter is the key to the soft chewy texture! Thank you for pinning,it’s much appreciated! Thank you for Pinning Karen! Oh I don’t think they’ll mind at all! LOL!! These cookies look yummy! Chocolate Chip Cookies are not my speciality, but I keep trying to make them and get them right. I will have to give this recipe a try. Thank you for sharing with all of us. What would we do without cookies? These look absolutely heavenly. I want a big batch right now! Thank you for linking at the In and Out of the Kitchen Link Party. Hope to see you again next week. First of all, just love the name of your blog! It makes me think of warm, out of the oven cookies, cakes, and pies. And these cookies look so yummy! Pinning these! Thanks for coming and linking up at #The Weekend Social. Please be sure to come back next week starting Thursdays at 9PM EST on KitchenDreaming.com ! I hope to see you there! 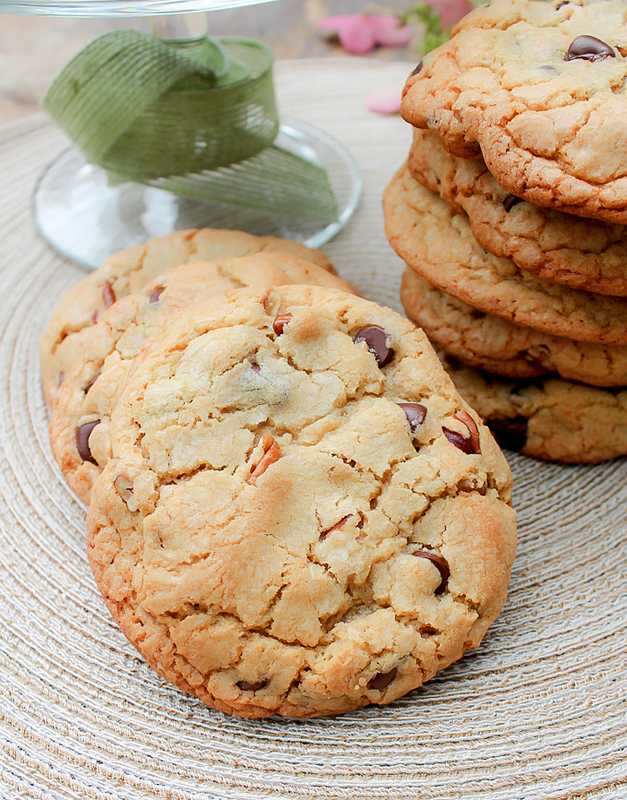 I love some Awesome Chocolate Chip Cookies, can’t wait to make these! It seems pretty clear that you nailed these cookies, Mary. They look perfect and we can only imagine how delicious they must have tasted. We are making these are best of show, on Platter Talk. I finally made a chocolate chip cookie that didn’t break a tooth when you tried to eat it. Lol. Thanks so much for sharing! You’re welcome Rhonda,they are definitely a keeper! Hi! just wondering…can I chill the dough overnight? Will this affect the baking or cookie at all? Hi Jenna! Chilled it may not spread as much while baking. But if you want to make it ahead and chill it over night, let the dough sit on the counter a bit before baking to take the chill out of the dough. let me know how it works for you! I had a snow day today so I had some extra time and a huge sweet craving. I decided to try your recipe and it was wonderful. The directions were different than the typical chocolate chip cookie recipe so thank you for the detailed instructions. I followed them exactly and they turned out great. 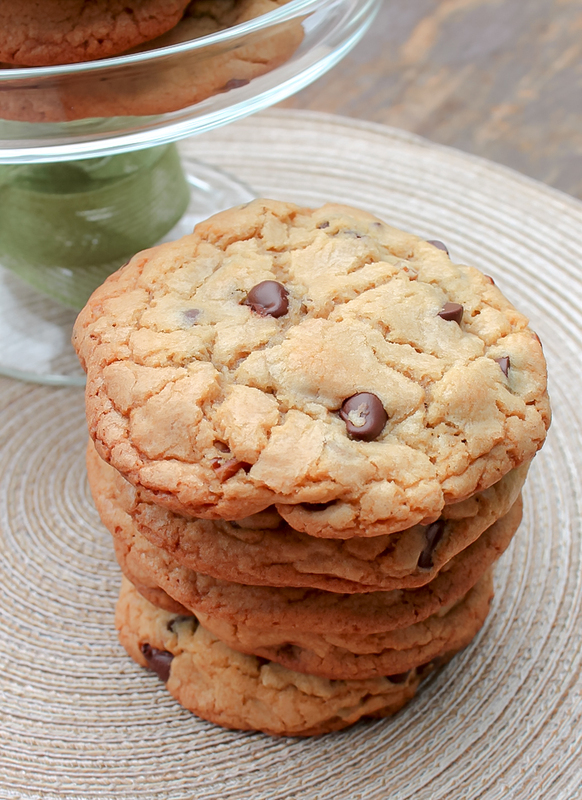 I never need to try another chocolate chip cookie recipe this one is perfect. WONDERFUL Julie! I’m so happy you made and loved them! Thank you for coming back to tell me! Would you be able to double this recipe? Yes Cheryl, you can double the recipe. You’ll love these cookies! Me Lovin’ You Bunny!! These cookies are TDF!! They came out as you said – SO good! I look like pro, …..these look like cookies you’d buy at a bakery…..many many thanks from me and my family…..these will be on the short list, from now on…! Oh Lisa, you made my day!! Thank you for coming back to tell me!! This looks like a fantastic recipe. I have searched for decades for something like this that uses butter instead of shortening to produce a sort cookie. Nut allergy question: if I leave out the nuts do I increase the chocolate chips or is it ok to just omit nuts and leave chocolate amount as stated? Thank you! Anne, I’d add a couple more chips to the batter if you could. can you make the cookies smaller? My family likes multiple cookies, and don’t care what the size of the cookie is. Betty, sure you could make them smaller, the bake time will be shorter though. Just keep an eye on them. These look SO yummy! I can’t wait to try them!! I must make these with my granddaughters when they come to visit this summer…yummy! Love pecans Mary! I could so go for one of your cookies now! Pinned and shared! Mine went flat! What did I do wrong? Sheri, not real sure, do you think your baking soda was out of date? I made these last year for our church festival, and they were a big hit. I plan to make them again this year. Great recipe. Thank you Nata for coming back to tell me, I love that! I assume that these can go immediately from the bowl to the oven without any chill time. Am I correct? Visiting from Sunday Features link party. I love how big and fat these are, I’ve never had my cookie with pecans before, I’ll have to try it sometime. Oh, there is nothing better than warm cookies right from the oven with a glass of cold milk. These look like winners. Pinning for making later. Thanks for sharing !! Thank you Rebecca, I appreciate it! I have made these cookies before and they are delicious! I am thinking of baking them as favors for my wedding in September. 2 questions…have you ever froze the dough and baked later and also, how long to these generally stay fresh? Naz I’ve never frozen THIS dough. But you can freeze cookie dough. They’ll stay fresh for a couple days for you. This is seriously the best cookie ever!! I made a bunch of cookies for Christmas and this was by far my favorite! I hope you don’t mind I share this recipe on my blog with credits to yours at the end. I completely love your blog!